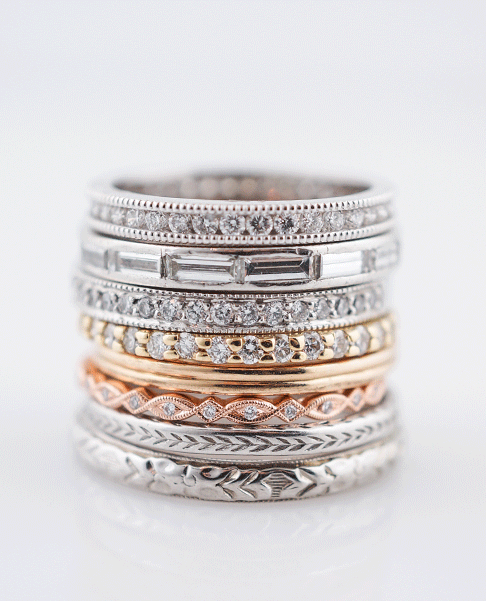 Most of our rings are set with antique natural Old European Cut diamonds . Most of our diamonds are original antique and vintage old mine cut diamonds or old European cut diamonds and in some cases date back to the mid-1800’s. We do not sell synthetic diamonds, treated diamonds or laboratory enhanced diamonds. Our colored stones are possibly heat treated or oiled; both treatments are considered industry standard and practiced by all top jewelry houses in the world. Some of our vintage and antique engagement rings will feature period correct synthetic side sapphires or other gemstones. You will see a variety of metals in different purities on our website and all are considered precious metals. 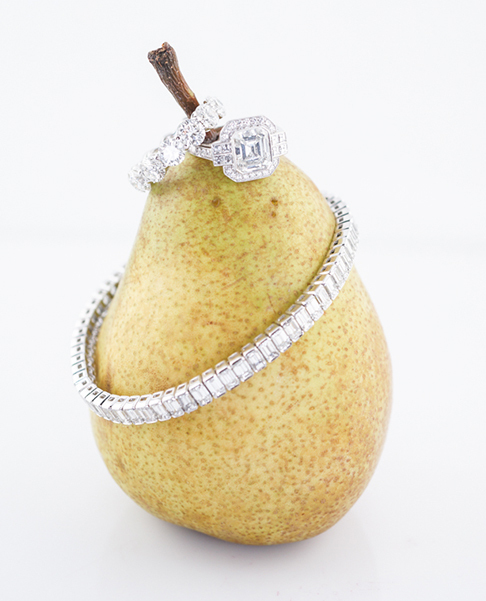 All of our jewelry is solid precious metals: platinum, palladium, gold and silver. Gold purity ranges from 9 karat, 10 karat, 14 karat, 18 karat, 20 karat, 22 karat to 24 karat. Platinum rings will often be composed of 90% platinum and 10% iridium. Iridium acts a balancing agent in platinum which is an extremely pliable metal. To understand clarity it is important to note that diamonds are carbon. Anything in the interior of a diamond is also carbon. Carbon inclusions come in different styles from small black spots (pique) to long white lines (feathers). How many inclusions there are, the type of inclusion and where they are located determine the clarity grading. Most of our diamonds are considered “eye clean” meaning no visible inclusions and must be located with a 10x (power) jewelers loupe magnifying 20/20 vision. Quite a few of our old European cut diamonds will be in the near colorless or faint yellow range. The chart provided is an exaggeration of color. A diamond that is rated a K, L or even M in color will have slight warmth to it but will often appear white to the eye. Old European or old Mine cut diamonds appear whiter due to the faceting structure and refraction of light. 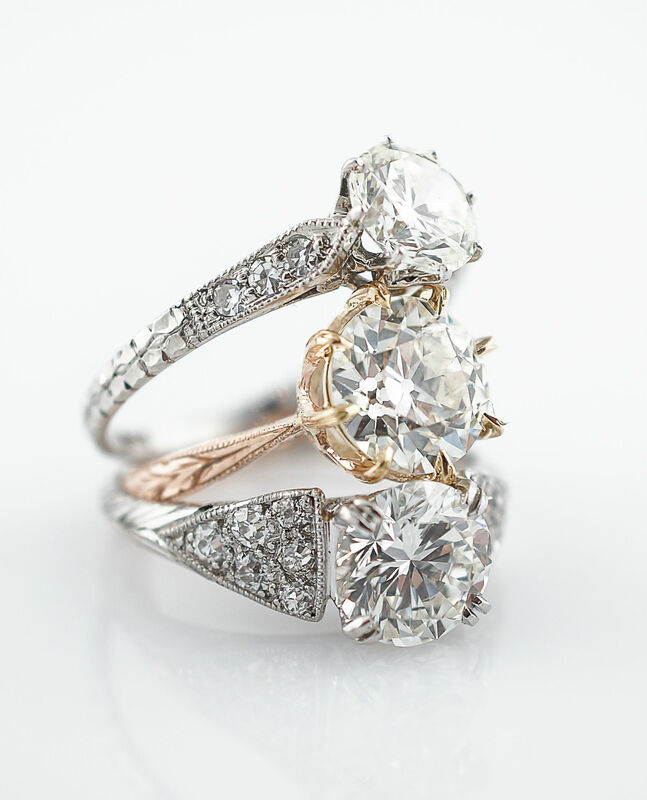 We love the original warm antique diamonds for their historic beauty and scintillation. People often ask us why there are not more old European cut diamonds available in the colorless range. Simply, as technology and innovation of diamond cutting evolved during the 1940’s and 1950’s there was a demand for the newest cut. Many of the old cut stone were re-faceted and resold as modern round brilliants. Carat is the actual physical weight of the diamond. To determine the weight of a diamond you can weigh the loose diamond by placing it on the scale. If a diamond is mounted you can determine the approximate carat weight is calculated by measurements. Diamonds get exponential more rare as the size increases which also means the value in exponentially higher too. Most people think of the definition of cut as being the shape of the diamond for example: round brilliant, emerald, oval or radiant. This is the most commonly known definition of cut. The second cut reference is based on the proportion of the diamond. The way light refracts into and out of the stone. Most of Filigree Jewelers diamonds are old mine or old European cut diamonds. These vintage and antique diamonds do not fall under the parameter of modern round brilliant cut standards. The faceting structure is different. Old mine cut and old European cut diamonds have a sparkling effect and dance under light. Round brilliants have a sharper and more angular refraction of light.